Best Snow Roof Rakes Description: Winter is coming! It’s a beautiful to see snow through your windows from inside the house but with it come’s a routine of cleaning up of our roof which becomes a part of our chores that usually takes place on winters. It’s very crucial that we take care of our roof and take part in this activity occasionally as there will be snow built-up on our roofs which may affect outbuilding structure and cause some severe damages. The best way to tackle this situation and getting snow under our control is by using a suitable snow roof rake. This simple design with a long handle gets your job done while you are standing on the ground with less effort. The market is filled with so many types of rakes these days. And each has great features to look forward but then also lack in durability. So it’s vital that you choose a rake which is beneficial for task-specific and eliminate the snow quickly. The product come in different shapes and sizes some a lot heavy which can be challenging to move and some lightweight which may get flex under pressure. To save you from the daunting task we here at ReviewCart have listed out the top 10 best snow roof rakes, so it’s easier for you to make a decision and get the best product from the market. This well-designed snow roof rake will remove snow, wet leaves, and other debris from your roof easily with minimum ease. This product measures about 21 feet long and weighs around 4.8 pounds which is quite good for handling. With it excellent reaching capabilities combined with lightweight it makes a suitable product for continuous usage. The product features an oversized poly blade that measures 25 x 6 inches with a twist-n-lock mechanism which makes fitting and removing the head from handle quite easily. While the telescoping allows you to increase or decrease its length for reach, it feels smooth on hand and also has a firm grip which is comfortable. This refreshing new snow roof rake from Blossomz combines an exciting combination of reliability, practicality, and convenience. This product comes with a long telescoping handle that measures about 17 feet when extended full it provides long reach without requiring scaling on ladders and straining you. Its 6 x 24 inches poly blade is well-designed and sweeps a large area in fewer sweeps. The handle s made of high-quality aluminum, and the blade is plastic, so the rake is lightweight which therefore makes it’s quite comfortable in continuous usage. The blades will not be hard on the roof and won’t leave scorches or dent behind after the job is done. Suncast SRR2100 snow roof rake will help you clear snow and debris from your roof without any struggle. It comprises of a 21 feet long aluminum handle for extra reach; it’s among the most extended and lightest rakes in the market. The product comes with a graphite blade with a non-stick surface that helps by not sticking to surface or leave any scratches. The great specification of 24 x 7 inches clears snow and debris faster and with less effort. The handle itself can be dissembled into small sections to fit easily in your storage area. This blue snow roof rakes true temper 1634500 from AMES companies; Inc will quickly and conveniently make you get rid of snow and debris on your roof. The product comes in with a telescoping handle that measures around 17 feet and the rake measuring 22 inches in width. The rake handle is constructed of high-quality light, sturdy aluminum whereas the blade is constructed of a high-grade strong poly material for durability. Its good length and lightweight is an added advantage that can help for continuous usage without giving stress to your hands. The design of the product is ergonomic and smooth in feel which provides a comfortable grip. This snow roof rake delivers a unique combination of efficiency and reliability from Minnwnowta roof razor which is among the best in the market and takes great pride in their product. 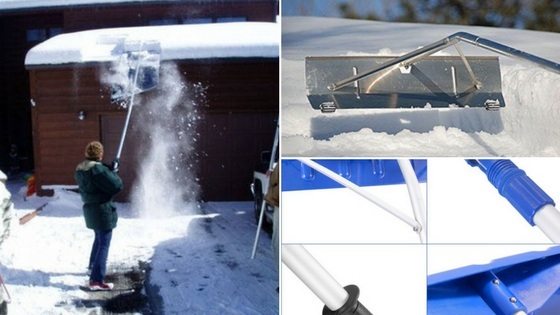 The snow roof rake boasts of an aluminum telescoping handle that is easily adjusted to suit your need. The blade is well-constructed and is made of a poly material, it’s quite light on hand but does a great job in removing snow, wet leaves and other debris. Its easy use helps in clearing large chunk in fewer sweeps and features a non-slip handle for extra grip at work. The lightweight and good length come in as a good support system to use this rake continuously with minimum ease and without causing any discomfort to hands. This lengthy and high-quality snow roof rake which is 17 feet from AMES Companies, Inc is very useful in clearing out the wet leaves and snow from you roofs faster and easier. This product comes with an extendable handle which is up to 17 feet in length to cover distant location without scaling ladders. The large blade on the front is crafted carefully from high-quality, sturdy poly material and clears a wide area in every sweep. The telescoping handle is adjustable to it length suiting your need by just pushing the button, and the non-slip handle improves your grip. You can easily store the rake one of its features is a hole at the end of the handle for it. The dynamo roof razor rake- snow roof rake product from MinnSnowta is a great deal in helping you remove snow and wet leaves from your roof. The product is convenient and safer in its approach to clear the snow; the dynamo rake is quite famous for its long reach and adjustable handle which is user-friendly and require less effort. With it, the long handle is reached distant location and cover the area with every sweep without struggling. The strong wide poly head provides extensive coverage of the area compared to other options and doesn’t scratch the surface. GPRR24U Yukon snow roof rake from Garant is a fantastic product in eliminating snow, wet leaves, and other debris from your roofs, skylights, and awnings. The product features sturdy long aluminum handles that come in 3 sections each. It’s up to the user’s requirement to use one, two or all the pieces together depending on the area that they are targeting to clean up. The simple and practical design makes assembly easy while the wide angled head improves and removes snow faster. The rake itself is lightweight and has a non-slip grip to enhance the performance. RJ204M by Snow Joe is a well-deserved snow roof rake on the list of top 10 best snow roof rakes in 2018 just for the fact that it delivers a quality product with amazing features. Like all the other type snow roof rakes it eliminates snow, wet leaves, and other debris from your roof. The unique twist-n-lock mechanism is easy and quick to attach or detach the blade. The high-quality telescopic handle can extend entirely up to 21 feet while the reasonably wide blade which measures about six by 25 inches gives maximum coverage of the location. The Blade itself is constructed of durable poly that won’t leave any scratches on the roof. Thanks to its lightweight handle it makes it easy and smooth, and also its non-slip, ergonomic surface are added features which makes it a better product. Looking out for an efficient snow rake then Garelick 89421 Snow Roof Rake is the one you should try. As a user, you can be stress-free about falling while standing on a ladder or not able to reach the distant location. This product offers a sturdy built-up and practical snow roof rake which does the job efficiently. The roof features a robust and lengthy aluminum handle measuring about 21 feet and comes in 4 different sections for secure storage purpose. Assembling the pieces is quite easy thanks to its smooth-snap mechanism. The blade measures around 24 x 7 inches and will eliminate snow without harming the surface of the roof. When you are figuring out for the essential elements you tend to have so many questions, and most of the answers received have different views and all sort of details but not up to your satisfaction. Let us simplify it in these below sections which without a doubt will be easier for understanding. Size: Choosing a perfect length rake is essential it shouldn’t be too long or too short just the right size to get the job done. Comfortable: A solid grip on a smooth handle will result in comfort and perfect balance. The ergonomic design ensures the rake can be used for a long time without getting tired. Weight: Just the right amount of weight will help you move the rake efficiently. Lightweight gives you faster moving and easily portable. Material: the most common material used on a rake is aluminum, plastic, and other conventional polymers. You have to choose a sturdy, lightweight product that offers corrosion/rust resistant and also weatherproof so that its stays for a long time. Sturdy: An excellent sturdy product will help in removing snow without flexing hard and doing the job with minimum ease. The listed products in this articles give you an excellent start for 2018 by choosing a perfect snow roof rake based on your needs. We have reviewed the product keeping in mind your requirements by mentioning the important factors that include material, weights, comfort, and size. The entire product come in an excellent standard quality as they are in our top 10 list of most rated items on the market but as a consumer, it’s your choice to select the one that you feel is best for you. Snow roof rakes from different brands almost share most of the features it the correct combination of elements with an ergonomic design that suits your nature of the job of clearing the roof with minimum effort that counts the most. The product comes in different sizes, design, color, and quality it’s important that it does not flex with continuous usage and stay for an extended period. Select from the above list which offers you good understating of the product.